Standing majestically in the midst of the crowded old city, is the Charminar-the huge but elegant arch, a masterpiece of Qutub Shahi architecture. It is located amidst the colourful shops of Lad Bazaar (Choodi Bazaar) with its glittering traditional bangles, pearls and bridal ware in the old city. Unique to Hyderabad, this square structure has delicate stucco ornamentation, four tall minarets and a mosque on its top floor. This imposing monument was built, as the legend goes, by Sultan Muhammed Quli Qutub Shah in honour of his Hindu Wife, Bhagmati, between 1591AD and 1612 AD, soon after he shifted his capital from Golconda to Hyderabad. Built upon four grand arches facing the four directions with its high slender minarets and spiral staircases, the structure reflects the glory of the Qutub Shahi dynasty. Often called "The Arc de triomphe of the East", Charminar gets its name from its four gracefully carved minarets literally meaning 'Four (char) Pillars (minars)'. The design is said to be based on Shia "tazias" erected in honor of Hussain, the son in law of Prophet Mohammad. The massive square structure, built entirely of granite and lime mortar stands on a square base and opens up to four directions through grand arches. Each arch is 11 metres wide and rises 20 metres to the pinnacle from the plinth. The clocks above each of the four archways were added in 1889. These arches support two floors of rooms and a gallery of archways. The structure stands in a junction and the arches overlook four major thoroughfares. There are four minarets in the four corners which soar upwards about 22 metres from the roof of the square structure. Each minaret stand on a lotus-leaf base that is a recurrent motif in Qutub Shahi buildings and has four floors, each looking like a skillfully carved ring around the minaret. In between the floors of each minaret, there are spiral staircases of 149 steps which ascend to triple tiers of balconies from where one can have beautiful views of the old city. From the ground to the apex, the minarets cover a length of 56 meters and on top they taper off to a bulbous dome crowned by a brass spire. The dome is decorated with petal like motifs. The upper levels of the Charminar were used as a madrasa and mosque, from where royal proclamations were read out to the assembled public. The beautiful mosque is situated on the western section of the top floor facing the holy city of Mecca. The rear wall of the mosque is indicated by blank niches framed by petalled ornament. There are 45 open air prayer spaces without roof, to accommodate more people in Friday prayers. To the east of this space is a spacious verandah with large open arches in the center, flanked by smaller ones on both sides . There is a water tank in the middle. The first floor has beautiful balconies from where one has a fantastic view of the historic city. Charminar has become an inseparable part of the history of Hyderabad. There is a belief that Charminar was built to mark the end of an epidemic of plague in the city. The beautiful structure looks spectacular particularly in the nights when it is illuminated. The arch is illuminated each evening from 7pm to 9pm. Open Weekdays: 0900-1700; Saturdays: 0900-1700. 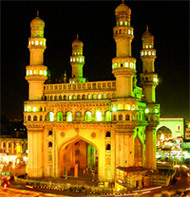 The bustling bazaars near Charminar sell pearls, bangles, dresses and typical Hyderabadi delicacies. Nearby there are many structures that are historically and architecturally significant.